Homeschool Creations: You Are Invited! 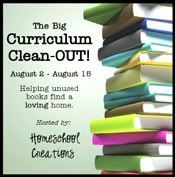 To: The Big Curriculum Clean-Out! Why: To win some great stuff and clean out some of the excess from your closets! RSVP: Just by showing up Sunday morning - pajamas and all. There are some great giveaways coming!! My post is all ready to go and will auto-post tomorrow morning. Of course I will need to link it back to here, but the hard part is done. I'm ready to go got it typed and scheduled to post! I grabbed your "Curriculum Clean Out" button and posted it at http://myfourmonkeys.com. I am also a homeschooling mom of four, ages 8, 6, 4, and 1. Great idea! I'll have to check my shelves and see if I have anything to contribute.